Guinot is regarded as the benchmark for leading beauty salons. Having committed more than 40 years to their quest to make women more beautiful using innovative beauty care methods they have emerged as world leaders. Guinot founder, Jean Daniel Mondin, chose to study pharmacy and obtained a doctorate before going onto redefine the concept of "cosmetics" through his own perspective and his medical roots. In his VIP treatment room, at the beauty salon in the Hotel George V in Paris, he offered exclusive Guinot treatments, in particular the Hydradermie treatment, to a clientele of foreign VIPs visiting Paris. It was this prestigious location which was the setting for the beginning of the brand's influence. A reputation which was initially built by word of mouth. Guinot decided to exclusively entrust beauty salons with its treatments and only those businesses with qualified beauty therapists can perform professional beauty treatments. Guinot regards qualified beauty therapists as a "beauty doctor" able to prescribe the most suitable products for the skin ensuring that Guinot today has become "the benchmark" for beauty salons. Springs Beauty are delighted to offer the full range of Guinot treatments. 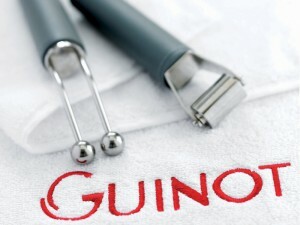 To view Guinot treatments click here.